Dooster is great for collaborating on tasks and projects with other people. Typically an account owner will invite Team Members into their Dooster where they can give them access to one or more project – depending on their permission levels. However this online collaboration can go even further by allowing users with different Dooster accounts to share. Jane might have a Dooster account jane.dooster.net while Mike has as separate account mike.dooster.net. They decide to work together on a project. Dooster’s account sharing feature means they can both see the same project in their respective Dooster accounts. BUT they cannot see any of each other’s other projects. The advantages of sharing are that both account owners can see all their stuff on the same screen. A common issue with other tools, for example, Basecamp, is that if two parties decide to work together and they both use Basecamp then they have to agree on whose Basecamp account they will use. The winner has the advantage of seeing all their tasks on one screen. Using Basecamp the loser would have to log in and out of the other person’s Basecamp account and would have to check both accounts to see all their stuff in one place. Seeing all your stuff in one place / on one screen is a major benefit of online project managers like Dooster. It’s powerful for a number of reasons. For example, you can see all your upcoming events coming towards you, like a conveyor belt. This allows you to plan things better and helps you feel more in control. Any change to the Shared Project in one account will be reflected in the other instantly. 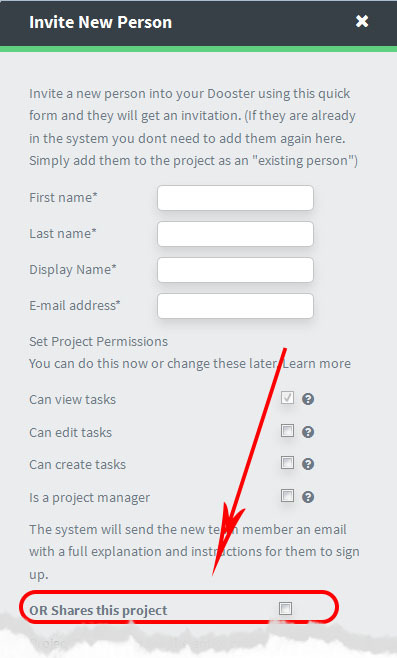 You will both have Project Manager level permissions for the Shared Project. Like any Project Manager, sharers can only see the projects they have access / permissions in. So your other projects are not visible to the other sharer(s). A project can be shared or “un-shared” at any time. Several accounts can share the same project. The person will be sent an email telling them what to do. In the “Your Team” screen, there is a section Sharing this project. (Note: this is only visible in the project that initiated the sharing). Click on the Stop sharing link. This will remove the project from the sharers account. They will no longer see it. If someone has shared the project with you and you want to remove it from your account: You can delete the shared project. This removes it from your account but preserves it on the other person’s account. * To Un-assign Tasks use the “Project Overview” screen / at the top of the screen, select dropdown “See All Tasks in One List” / Then, at the top of the screen, click on “Filter Page” = Tasks assigned to [name of the sharer] / Select all / Unassign each task from the sharer by re-assigning to yourself or someone else).